>It’s Sunday, and I’m basically adjusted to the time now. 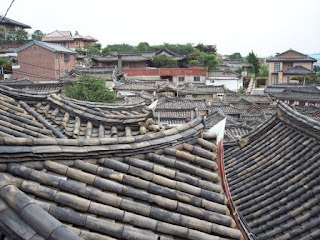 At breakfast this morning, several of us decided we would search for a the Bukchon hanok maeul, a traditional neighborhood of Korean-style homes not unlike the hutong neighborhoods of Beijing. Like the hutong, hanok are disappearing and the cities where they exist have belatedly embraced preservation. When we lived here decades ago, though, these neighborhoods were common–and there was no need to call them by this special name, or take any steps to preserve them. The were just normal. 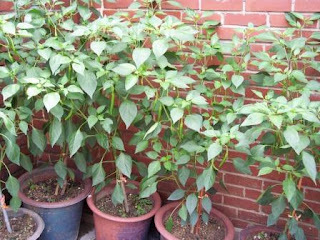 When we did get there, we found them interesting but a little disappointing, simply because they were so familiar to us. 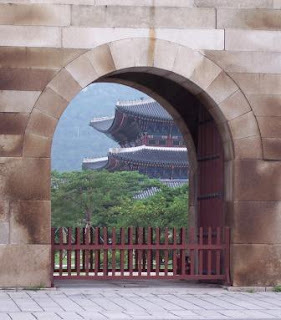 On the way, we passed by the east edge of Gyeongbukgoong and the Folk Museum. You can see part of the structure through the gate in this photo. 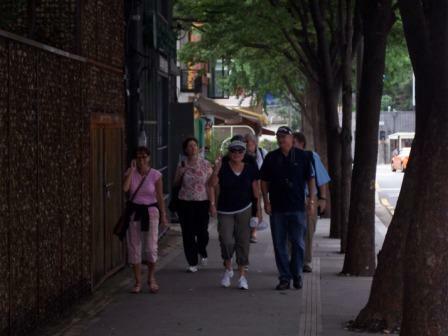 The walk toward the hanok was somewhat uphill. But eventually we got there, and found a spot for some interesting photographs of the rooftops of the neighborhood. One of the houses had these hot peppers growing right outside the front door, and then we saw these growing in front of several more houses. 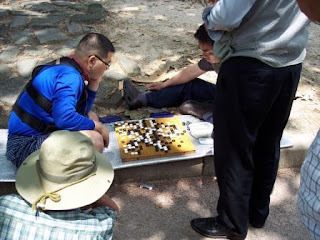 We kept walking around and eventually headed back toward downtown, when we found this little part that had a lot of mostly older men playing paduk and changgi. 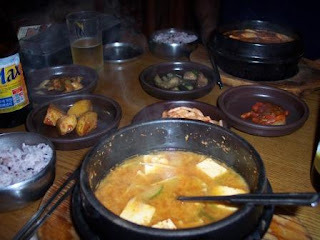 And finally we found a little restaurant in Insa-dong where we had a couple of different kinds of chiggae–spicy stews, and some refreshing cold beers. Wonderful lunch! We then came back to the hotel to register for this program that begins in earnest tomorrow, and during and after dinner we had our “orientation” — reminders of what our schedules are. We’ve got a pretty full week. >Fascinating reading, Clifford. I had thought this was one of those wonderful "research" trips but then you mentioned "program" today – I am intrigued!